With summer fast approaching, it’s almost time to fire up the barbeque and get grilling on the weekends. If you’re looking to spice up your barbeque game this summer and want to take your grilling to the next level, then it’s a smart idea to invest in some tasty seasonings. 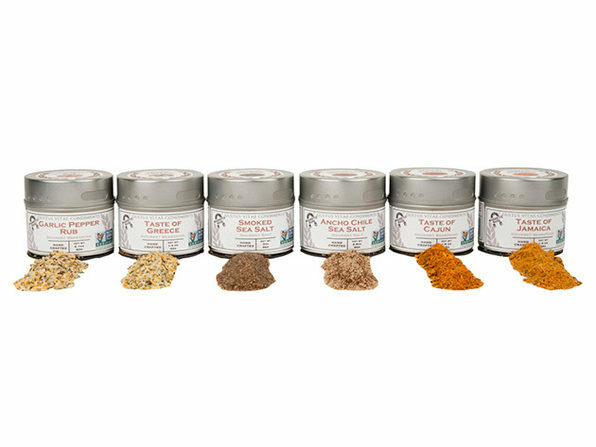 You can do just that with these Gustus Vitae Spice and Salt Collections — all for less than $40. This BBQ collection adds a colorful world of flavor to your next grill out. You’ll get Smoked Sea Salt, Ancho Chile Sea Salt, Garlic Pepper Rub, and tastes of Greece, Cajun, and Jamaica, all of which are of the highest quality — they’re even certified non-GMO. Every seasoning contains all natural ingredients and is free from artificial colors and flavors, which means you taste what you see and can identify each ingredient with ease. Plus, all the salts and spices are crafted in small batches and hand-packed in California from local and imported ingredients, so you know time and effort went into making the personal collection you receive. On top of enjoying a diverse set of all-natural flavors, you’ll love the convenience of using this collection. Just stick the tins on your fridge, grill, or any other metal surface with its magnetic backing and grab what you need, when you need it. Spice up your next barbeque with a Gustus Vitae Spice and Salt Collection for $39.99 in The Daily Caller Shop. That’s 33% off the original price of $60.